According to the American Association of Clinical Endocrinologists (AACE), more than 60% of patients with diabetes don’t reach hemoglobin A1c targets, increasing their risk of potentially life-threatening complications. However, new advances in understanding the kidney’s role in glucose homeostasis have helped identify innovative treatments, such as canagliflozin (INVOKANA), which may address many of the shortcomings of conventional drugs. The rapid pace of research on new medications for treating diabetes can be challenging for dietitians and diabetes educators who want to give their patients the most accurate, up-to-date, evidence-based information. This article will provide a brief history of SGLT2 inhibitors, insight into the role of the kidney in glucose homeostasis, and canagliflozin’s mechanism of action, indication, efficacy, safety, and nutrition implications. Meal-planning tips for conventional antihyperglycemic medications also will be discussed. Canagliflozin is the first SGLT2 inhibitor approved by the FDA but not the first to be identified. “The first SGLT inhibitor to be identified was phlorizin, an O-glucoside analog first extracted from the root bark of an apple tree in 1835,” says Jimmy Ren, PhD, therapeutic area lead in metabolics and medical affairs at Janssen Pharmaceuticals. Phlorizin inhibited both SGLT1 (found primarily in the gastrointestinal tract) and SGLT2.3 “However, due to its low bioavailability and high susceptibility to degradation, phlorizin didn’t progress to clinical trials,” Ren explains. When glucose levels exceed the capacity for renal glucose reabsorption, glucose is excreted via the urine. The plasma glucose concentration at the time this occurs is called the renal threshold for glucose.4 In people with type 2 diabetes, the renal threshold increases, causing more glucose to be reabsorbed before glucose is excreted, contributing to the worsening of hyperglycemia. This is where canagliflozin comes in. Canagliflozin reduces blood glucose by acting on the kidneys as a “glucuretic” to promote the loss of glucose via the urine. Canagliflozin “selectively inhibits SGLT2, thereby lowering the renal threshold for glucose and promoting renal glucose excretion,” Ren says. So what historically has been viewed as a sign of poorly controlled diabetes—glucose in the urine—is now a desired outcome of canagliflozin and an actual measure of efficacy. “Since this drug causes glycosuria [glucose in the urine], there will be a need to reeducate patients that glycosuria is a sign that this medication is working rather than a sign of poor diabetes control,” says Linda Delahanty, RD, chief dietitian and director of nutrition and behavioral research at the Massachusetts General Hospital Diabetes Center who also coauthored Beating Diabetes. In addition to improved glycemic control, both doses of canagliflozin produced significant reductions in body weight and systolic blood pressure. “In patients with type 2 diabetes, approximately 80 g/day of glucose was lost in urine during INVOKANA treatment,” Ren says, which translates to approximately 300 kcal lost per day. Nutrition professionals agree that medical nutrition therapy including physical activity is the cornerstone of type 2 diabetes management. However, the progressive nature of type 2 diabetes usually requires the addition of one or more glucose-lowering medications and eventually insulin. 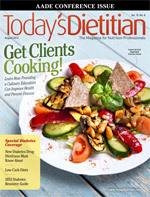 Dietitians and diabetes educators play a major role in educating patients about when and how to take their diabetes medications. They also provide guidance on how to prevent or minimize adverse effects of medications. The following is a brief overview of the currently available classes of diabetes medications and meal planning strategies for each. Biguanides enhance insulin sensitivity in the muscle. They decrease hepatic glucose production by reducing gluconeogenesis, the formation of glucose from noncarbohydrate sources, and by decreasing glycogenolysis, the breakdown of glycogen to glucose.6 Biguanides have the potential to decrease vitamin B12 and folate absorption, so RDs should monitor B12 and folate levels for changes.6,7 Biguanides aren’t associated with weight gain and actually have the potential to promote slight weight loss. Currently, there are two drugs in this class: exenatide (Byetta and Bydureon) and liraglutide (Victoza). Dietitians should encourage patients to increase fluids and drink sugar-free carbonated beverages to reduce the nausea associated with these medications. Amylinomimetics counter the effects of an amylin deficiency. Pancreatic beta cells cosecrete amylin with insulin in response to food intake.8 They primarily suppress glucagon release and lower after-meal glucose. 1. Media fact sheet: INVOKANA (canagliflozin). Janssen Pharmaceutical Companies of Johnson & Johnson website. http://www.multivu.com/players/English/60562-janssen-invokana/links/60562-K02CAN13156A-INVOKANA-Media-Fact-Sheet.pdf. Accessed May 21, 2013. 2. FDA approves Invokana to treat type 2 diabetes. US Food and Drug Administration website. http://www.fda.gov/NewsEvents/Newsroom/PressAnnouncements/ucm345848.htm. March 29, 2013. Accessed May 20, 2013. 3. White JR Jr. Apple trees to sodium glucose co-transporter inhibitors: a review of SGLT2 inhibition. Clin Diabetes. 2010;28(1):5-10. 4. Understanding the role of the kidney in glucose balance. Primary Care Diabetes website. http://pcd-glucose-homeostasis.com/journal/understanding-role-kidney-glucose-balance. November 3, 2011. Accessed May 28, 2013. Drugs/EndocrinologicandMetabolicDrugsAdvisoryCommittee/UCM334551.pdf. January 10, 2013. Accessed May 28, 2013. 6. Ross TA, Boucher JL, O’Connell BS. American Diabetes Association Guide to Diabetes: Medical Nutrition Therapy and Education. Chicago, IL: American Dietetic Association; 2005:81-89. 7. Pronsky ZM, Crowe JP. Food Medication Interactions. 17th ed. Birchrunville, PA: Food Medication Interactions; 2012.
metformin. Accessed May 28, 2013. 9. Medication guide: Bydureon. US Food and Drug Administration website. http://www.fda.gov/downloads/Drugs/DrugSafety/UCM289869.pdf. January 2012. Accessed June 1, 2013.